Figure 9.5 Map of Antarctica showing position of the Seymour Island locality (number 102 in Table 2.1 and Appendix) on the Antarctic Peninsula. boundary. Early reports on the palynology of Cretaceous and Paleocene rocks of Antarctica emphasized the record of marine dinoflagellate cysts, which showed no evidence of a major extinction event at the presumed position of the K-T boundary. 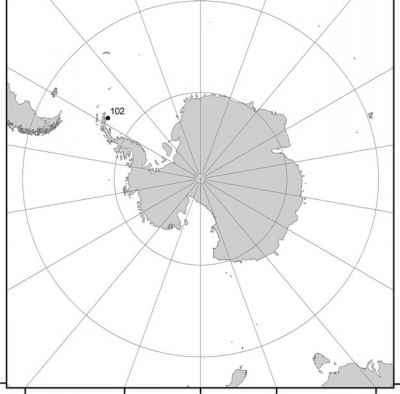 The only K-T boundary section that has been studied on the continent of Antarctica is on Seymour Island on the Antarctic Peninsula (Figure 9.5). The K-T boundary was approximately located within the Lopez de Bertodano Formation on Seymour Island (locality 102 in Table 2.1 and Appendix), based on the highest stratigraphic occurrences of marine foraminifera and ammonites (Askin 1988a, 1988b). Askin (1988b) located the boundary palynologically using dinoflagellate cysts. 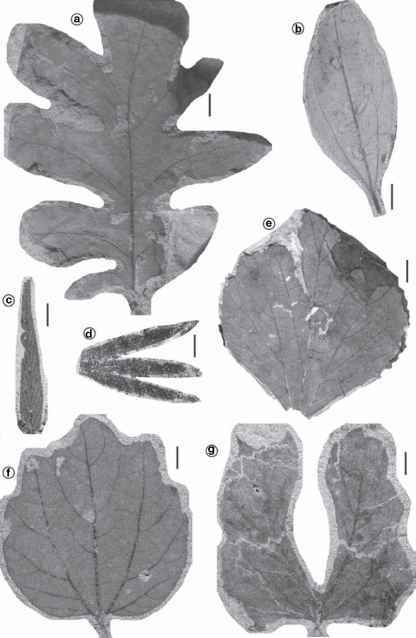 Her samples also contained pollen and spores of terrestrial plants that had been transported into the marine paleoenvironment. She stated that these terrestrial palynomorphs indicated little change in Antarctic land plants across the K-T boundary. Apparently Askin was basing her view on the record in Antarctica when she expressed some skepticism regarding the emerging palynological record from North America, saying that the reports were divergent and conflicting. Askin (1990) plotted the stratigraphic ranges of 41 angiosperm pollen species through the K-T boundary interval. No obvious extinction level is evident in Askin's data, but three taxa known to disappear near the boundary in Australia and New Zealand also disappear near the end of the Cretaceous on Seymour Island. Askin invoked climate change to account for palynofloral turnover across the boundary. Elliot et al. (1994) finally verified the position of the K-T boundary in Antarctica based in part on marine palynology (dinoflagellate cysts) with the discovery of an iridium anomaly at that level. The anomaly is less than 2 ppb but is about 40 times the background level. They concluded that their locality on Seymour Island provided no compelling evidence for mass extinction among terrestrial plants at the boundary. No fern-spore spike such as that later found in New Zealand was reported in Antarctica.